A couple of weeks back HCL launched, HCL ME U3 (Quick Review) a budget tablet with Android jelly bean Operating system which was priced ridiculously low at 5449 INR and was probably the cheapest jelly bean tablet available. LAVA has not beat HCL in this segment by Launching Lava E-Tab Velo+ with Android 4.2 only for Rs. 4699. Both the tablets however have almost similar specifications. This tablet comes with a 7 Inch display with WVGA 800 X 480 pixel resolution which amounts to a pixel density of 133 ppi. Most budget tablets these days opt for 1024 x 600 pixel resolution but at this price range this resolution is acceptable. 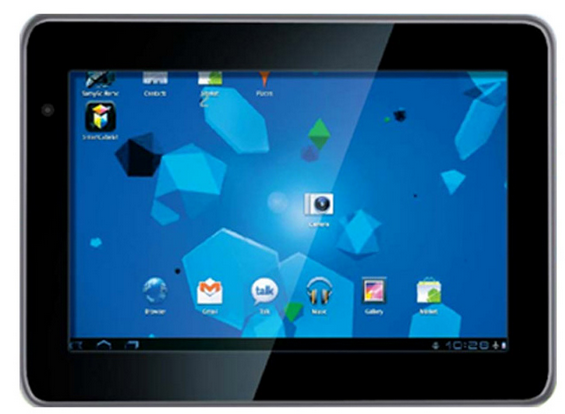 Lava E-Tab Velo+ is powered by a 1 GHz Cortex A8 single core processor. Though not a very powerful processor, it would be supported by Mali 400 GPU to further AID your gaming experience. The RAM capacity decent enough at 512 MB and the internal memory is 4 GB which can me further extended to 32 GB using a microSD card. The camera specifications are less than HCL ME U3 but most people are not very much bothered by the camera specs in their tablets. This phone has a VGA camera in the front but lacks a rear camera. The battery capacity is also moderate at 2500 mAh. We expect the battery to hold for around 5 hrs with moderate usage. This tablet supports 3G via external dongle and other connectivity features include WiFi, microUSB and 3.5 mm audio jack. Lava E-Tab Velo+ is an Entry level tablet for those who want portable android experience and are light on budget. It will be a good first time tablet for general purpose usage and moderate gaming. We have seen the competition in the budget android smartphone segment gone stiff in last few weeks. Will we see similar competition in the comparatively sluggish tablet market? Let us know what you thing in the comment section below.